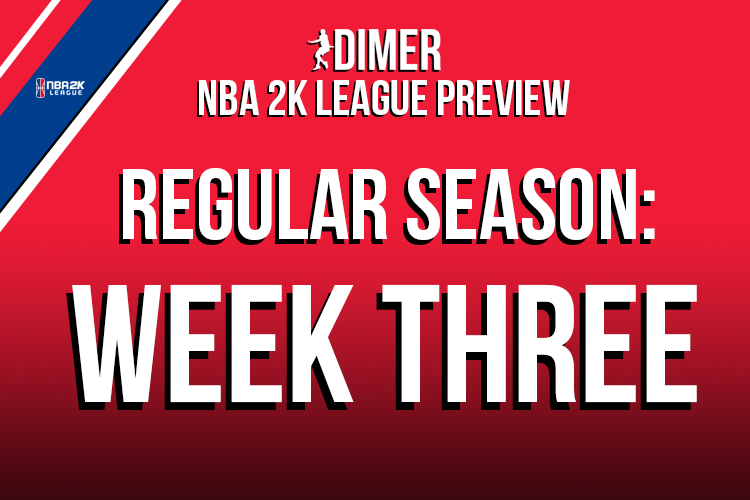 After an interesting second week of the NBA 2K League regular season, we roll on with week three. There are plenty of intriguing matchups and, of course, plenty of questions. Let’s preview what should be an exciting slate of league action. 1. How many more big lineup changes will we see? Week two almost had more changeups than we could count. Some seemed tactical, others were necessary and no one has any clue why the rest of them happened. Stars and role players alike found themselves on the sidelines last Friday and Saturday. So it seems inevitable that we’ll see more changes coming in week three, and every week for that matter. And while it’s true that teams may just be experimenting with new lineups early in the season, too much playing around with your starting five could leave you out of the playoff picture in a hurry. We are going to see some sort of change every week, but I think less and less teams are going to try it as the season goes on and they settle into their lineups. For now, though, it’s early, and who knows which stars could be surprise bench players in week three. 2. How will Pistons GT stack up against the more elite competition? I placed Pistons GT at sixth in my power rankings, despite them being one of only three teams with an undefeated record. My reasoning comes in their strength of schedule. Pistons GT has played two other teams in my top-eight (I mistakenly said in my week two review that they only played one other top-eight team), and they lost both to 76ers Gaming Club (as most other teams who faced 76ers GC have) and Cavs Legion GC. This week, they play another elite opponent in CLTX Gaming. I know I’m not the only one who is waiting to get a better gauge on the Pistons, and we may get some answers in week three. A win could prove they belong among the truly elite of the NBA 2K League, while a loss would give neutral viewers reason to start doubting this team despite their high placing at THE TIPOFF and fine regular season record so far. 3. Can Heat Check Gaming keep up the momentum? Plenty of questions were asked about just how good this Heat Check Gaming team is after a poor TIPOFF performance and opening week loss to Pistons GT. The pre-draft and pre-season hype didn’t match up with the results on the court. But FamousEnough insisted that people not put too much stock into what happened at THE TIPOFF, and Heat Check bounced back with a win over a short-handed Warriors Gaming Squad. Now, they square off with one of the league’s elite teams in Mavs Gaming on Friday. A loss wouldn’t really be any sort of indictment on the Heat—the Mavs are great and can go toe-to-toe with anyone—but a win would be exactly the sort of statement FamousEnough and Heat Check need early in the season, and it wouldn’t be too bad a confidence booster either. It also wouldn’t hurt their playoff chances. A win against Mavs Gaming could make Heat Check’s season. Expect them to play as hard as they have all season to try and secure this one. 4. Can surprise zero-win teams Pacers Gaming and Raptors Uprising GC bounce back? Calling the Raptors a “surprise” zero-win team may be a little unfair to them because their schedule has been, in the understatement of the century, tough. They opened up week one with a doubleheader against Mavs Gaming and CLTX Gaming, then had to face TIPOFF playoff qualifiers Jazz Gaming. Now, they must go up against league juggernauts 76ers Gaming Club in week three. Someone should look into whether the league schedule-maker has an ex from Toronto or something. Anyway, they’re 0-3, but it’s not the worst 0-3 team I’ve ever seen. In fact, they showed some promise after some lineup changes in their overtime loss to the Jazz last week, and I think they’re trending upward. Going 0-4, which let’s face it, is likely, wouldn’t mean they’re necessarily out of playoff contention, but it could be a backbreaker morale-wise. I don’t think their season is over if they lose this week, but it will be a tough mountain to climb. For the Pacers, they looked like a top-five team at THE TIPOFF, then completely got away from what worked in week one and took a bad loss to Grizz Gaming. In week two, they kind of went back to some of what worked but only went halfway and… lost again. They’re 0-2, which isn’t the end of the world, but they need to start gaining ground if they want to make the playoffs. If they drop their game to Cavs Legion this week, it won’t be time to panic, but they’re gonna have to get wins with some of the league’s very best still left on their schedule. With all the lineup changes happening across the league, predictions are silly and maybe even a waste of time. But that’s no fun! More close games this week, but I think last week was even tougher to predict. Here we go. Blazer5 has looked shaky to start the season, but they’re still among the league’s elite while Bucks Gaming continues to struggle. Heat Check has momentum, but is it enough to beat the Mavs? I don’t think so. The Mavs Gaming role players will really test this Heat Check defense. I’m calling the upset. Assuming the Pacers stick with WoLF at small forward, he’ll be as tough a defensive matchup as Hood can go against. TuckerLocksUp will give Sick x 973 some challenge if they both stay at center, too. The CLTX have some adjustments to make, but I think they have more talent and will overwhelm the Pistons, who have a tendency to put in shaky offensive performances. I keep talking about the Magic showing promise every week, but Knicks Gaming looks good, too, and I’m not sure Marley213s can stop GOOFY757. The 76ers are the 76ers. The Wizards are good, and they’re one of the better shooting teams in the league, but they still can’t outshoot the 76ers. I’m not entirely sure what to make of Kings Guard right now. But I still think they have more quality than the Grizz. The 76ers are the 76ers. The Raptors don’t have enough offensive firepower to keep up. Getting Shawn Win back will be a big boost for the Warriors. But they still have to figure out what their best lineup is. The Jazz are on a roll. As long as they keep up their efficient offense and underrated defense, they shouldn’t have trouble against the Grizz.